Toyah Willcox wowed crowds of fans with a Sensational performance at Wolverhampton’s Slade Rooms. The singer, songwriter and actress proudly presented her show TOYAH, featuring a full electric band, to celebrate 40 years in the music business. Now aged 60, the solo artist – who is from Birmingham – delighted fans with hit tracks including I Want To Be Free and Be Proud Be Loud. The event was held in the city on Friday evening. By her own admission, she’s not quite right. Toyah Willcox lives in a perpetual state of confusion, imagining that she ought to be doing something else or working on something new. She’s a little bit OCD – her words, not ours – and is never happier than when playing one thing off against the other. And perhaps that’s no surprise. After all, the one-time High Priestess of Punk has carved out a remarkable career as musician, singer, songwriter, actress, producer and author. In a career spanning 40 years, she’s had eight Top 40 singles, released more than 20 albums, written two books and appeared in more than 40 stage plays and ten feature films. She’s voiced and presented numerous TV shows and enjoyed such hits as It’s A Mystery, Thunder In The Mountains and I Want To Be Free. Now in her 60th year, it’s time to reflect. 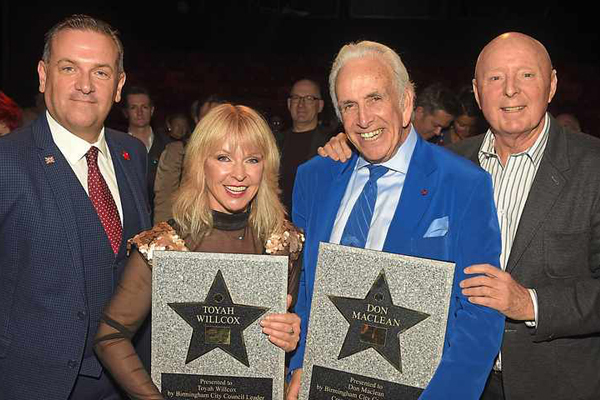 The entertainer who was born in King’s Heath, refused to move to London and now lives just up the road in Worcestershire, is back on the road with shows that double as a career retrospective. She’ll headline Wolverhampton’s Slade Rooms on Friday as part of a whistlestop tour that celebrates both her 60th year and her 40th year in music. • Continue reading at the Express & Star. The Birmingham singer and actress will play The Slade Rooms on a tour celebrating her 40 years in music. Toyah, from Kings Heath, is best known for songs such as It’s A Mystery, I Want To Be Free and Ieya. She will play the city centre venue on November 2. • Continue reading at the Express & Star. More info on all four “Birthday” concerts here. 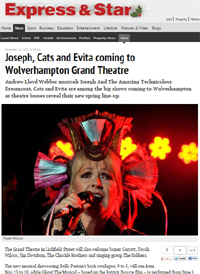 The Express & Star feature a photo of Toyah from this year’s Changeling Resurrection tour in their article on what’s playing at the Wolverhampton Grand Theatre in Spring 2013. Andrew Lloyd Webber musicals Joseph And The Amazing Technicolour Dreamcoat, Cats and Evita are among the big shows coming to Wolverhampton as theatre bosses reveal their new spring line-up. The Grand Theatre in Lichfield Street will also welcome Toyah Willcox, Hormonal Housewives, starring Toyah Willcox on April 2 and 3, features sketches about day-to-day problems that women face. A review of last night’s Birmingham Ballroom gig, by David Lumb at the Express & Star. It’s more than 30 years since Toyah Willcox launched her solo career – but anyone who thought the Birmingham singer was done and dusted has reason to think again after a headbanging performance in her home city last night. Dozens left the warmth of their homes on a cold and wet Wednesday evening to see an intimate gig at The Ballroom. Taking to the stage in a black Chinese-style dress with an ornate headdress and boots, she kicked off the show with Good Morning Universe, before moving on to Castaways, Blue Meaning, a song she said was inspired by Tolkien and the Black Country.